The cost of the meal/program is $17.50 per person. Monday, November 14th is the reservation deadline. Reservations can be made by mailing checks payable to the Surry County Historical Society for the number of persons wishing to attend to group member David Crawford at P.O. Box 469, Mount Airy, NC 27030. Contact information including a telephone number or email address should be specified along with the sender’s name. Reservations also can be emailed to crawforddr@embarqmail.com. A taste of local history as well as dinner will be on the menu for the annual meeting of the Surry County Historical Society here next week. The gathering is scheduled for Thursday from 5 to 8 p.m. at the Shelton-Badgett North Carolina Center for Viticulture and Enology on the campus of Surry Community College. Those attending next week’s annual meeting will be treated to a performance by The Nonesuch Playmakers theater group led by Brack and Angela Llewellyn of Mount Airy. 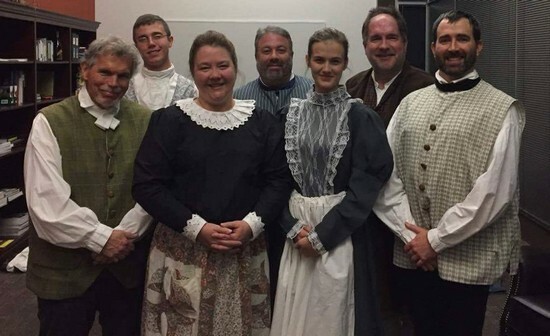 They sought to bring its early residents back to life by dressing in period attire and portraying various individuals in character — saying things they might have said while highlighted their roles in local history. Brack Llewellyn has said this was accomplished through factual information provided by the Rockford Preservation Society along with anecdotal material including accounts supplied by descendants of Rockford pioneers. All this was assembled so Nonesuch Playmakers members could write monologues for them. Among the individuals to be portrayed during the annual meeting are Thomas Ayers, John Thomas Longino, William Polk Dobson and Henry Speer. Marion Venable of the Surry County Historical Society said Thursday that women’s roles have been added for next week’s performance, which will include the Speer sisters who were notable residents of early Rockford. It was prominent as the center of county government, where court was held and spawned the establishment of hotels, stores, physician and lawyer offices, a blacksmith shop, a tinsmith, a tannery, a tavern and a ferry, according to information from Dr. Annette Ayers, historical society president. By 1830, a post office was added and a decade later both Methodists and Baptists organized congregations that shared a small church. Rockford was the cultural, political and economic center of the county until 1850, when Surry was divided into the present Surry and Yadkin counties and Dobson became the new county seat.